North Atlantic Site 982 is key to our understanding of climate evolution over the past 12 million years. However, the stratigraphy and age model are unverified. We verify the composite splice using XRF core scanning data and establish a revised benthic foraminiferal stable isotope astrochronology from 8.0–4.5 million years ago. Our new stratigraphy accurately correlates the Atlantic and the Mediterranean and suggests a connection between late Miocene cooling and dynamic ice sheet expansion. For the past 2.7 million years the Earth's climate has switched more than 50 times between a cold glacial and warm interglacial state. 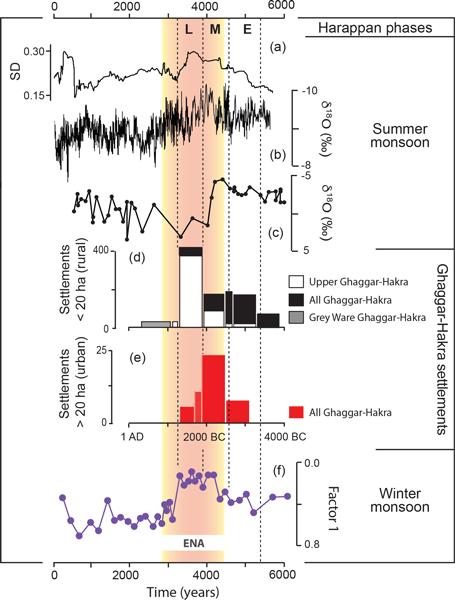 We found the trend towards larger ice sheets over the past 2.7 million years was accompanied by changes in the style, frequency, and intensity of shorter-term (millennial) variability. We suggest the interaction between millennial climate change and longer-term variations in the Earth's orbit may be important for explaining the patterns of Quaternary climate. We explore the hypothesis that a shift in global climate 4200 years ago (the 4.2-ka event), was related to the El Niño–Southern Oscillation (ENSO). We summarize records of coral-reef development in the tropical eastern Pacific, where intensification of ENSO stalled reef growth for 2500 years starting around 4.2 ka. Because corals are highly sensitive to climatic changes, like ENSO, we suggest that records from coral reefs may provide important clues about the role of ENSO in the 4.2 ka event.